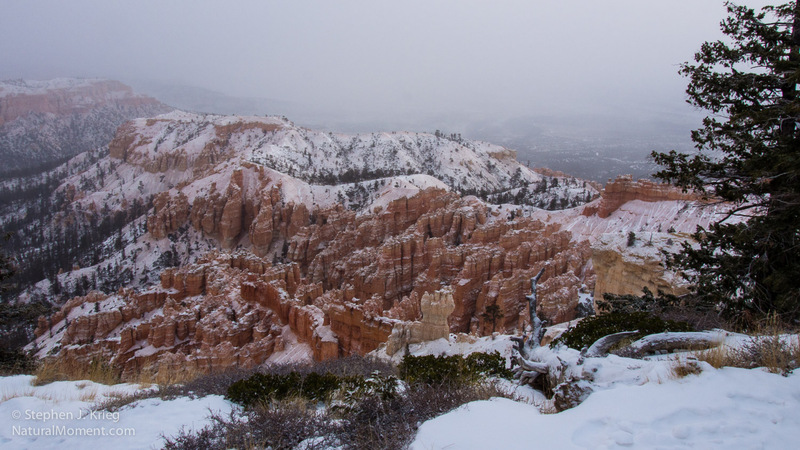 Snowstorm interlude, Bryce Point, Bryce Canyon National Park, Utah. So, wearing my self awarded title of Modern Day Mountain Man, I’d driven all day from central Arizona up to the top of the geologic Grand Staircase to Bryce Canyon National Park in southern Utah. To be there when a snowstorm arrived. It’s what I do, don’t try to dissuade me. Christmas morning tourists at Bryce Point. Still surprised by all the Asian tourists that had been at Bryce Point for the sunrise (such as it was, through the snowstorm), the clouds had closed back in. Let it snow. But no sense in going to my other favorite Bryce Canyon viewpoints to wait out the storm. Not since I had to drive all day to get home to southeast Utah, to San Juan County. This was a hit-and-go sojourn, to my chagrin. Ruby’s Inn parking lot, Christmas morning. Yes, I would have loved to have lingered. 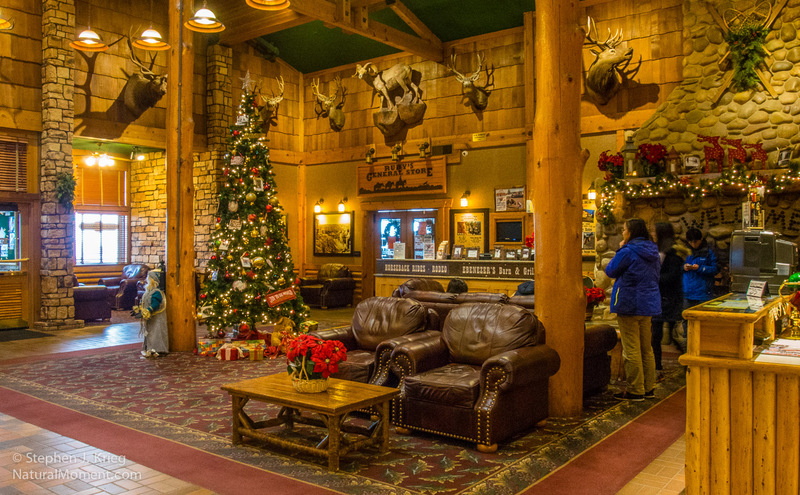 Being back at Ruby’s Inn at Bryce was so nice. I’d gotten in late and barely had time to sleep in such nice lodging, every detail attended to, and modestly priced. The front desk staff had given me a flyer for the Christmas morning breakfast buffet, only $5.50. As I passed back from my early morning photo shoot I was so tempted to indulge in the food. Rest a bit, eat, savor. But instead I rolled. Many miles to go, you know. 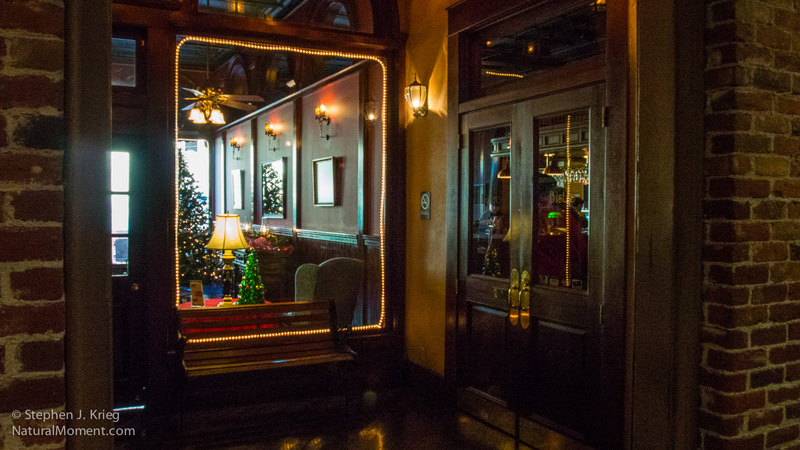 Ruby’s Inn lobby on Christmas morning. 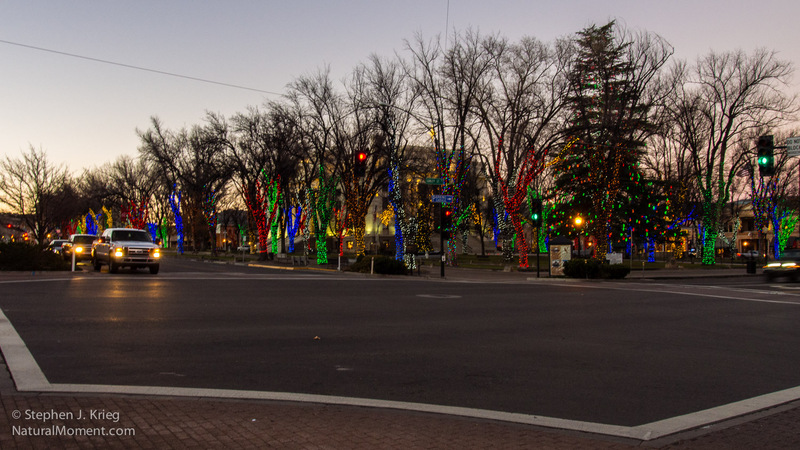 Christmas lights, morning, Courthouse Square, Prescott, Arizona. I was back in northern Arizona two days before Christmas. As always it was good to be back. But even Flagstaff hadn’t gotten much snow, except for up on the San Francisco Peaks. Bah. From there I descended another 2,000 feet to Prescott, which rightly bills itself as “Arizona’s Christmas City”. Courthouse Square is always lit up in its small town All American way. Two years ago I was fortunate to be there with snow on the ground, which adds so much to the lights. But not this year. I could have gone out that evening and done some night photography of the Square lit up, but I didn’t feel enough motivation. A bit too road weary. Looking into Hotel St. Michael’s lobby, Prescott, AZ. As it turned out I had to stay there a second night. My business was complete at 1 PM. What to do next? No snow in the forecast down here. Maybe an inch up at Flagstaff. 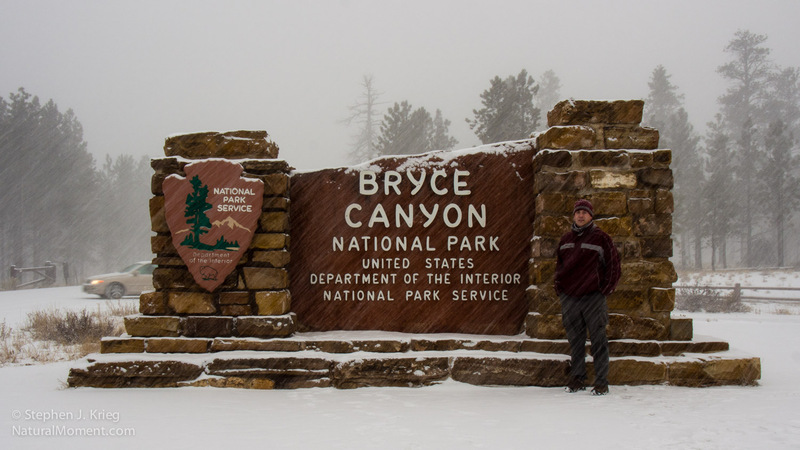 But…all the way up at Bryce Canyon in southern Utah, several inches coming in. A long ways from Prescott. Very long. But do-able. I was feeling good, and the prospect intrigued me. A dangerous combination, but also sometimes very productive. If you pull it off. 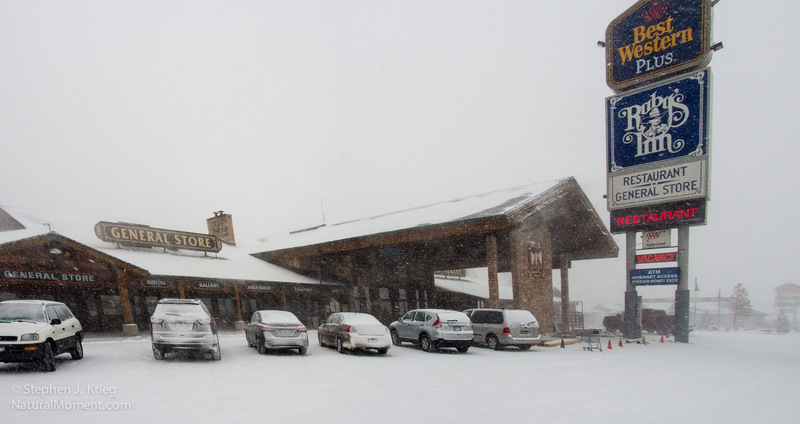 If you don’t know someone who would purposely drive toward a snowstorm instead of avoiding it…well, now you do. And I made it. I hate driving through the dark in beautiful country, because I might miss something. But sometimes it has to be done. In the morning I was ready well before dawn, checking the updated weather forecast and radar images. Yes, it was coming in, a dusting of snow outside with more approaching from the west. Morning, Bryce Point, Bryce Canyon National Park, Utah. As it got light I drove into the park. Several cars were ahead of me, judging by the tire tracks in the thin snow. It was now coming down hard. 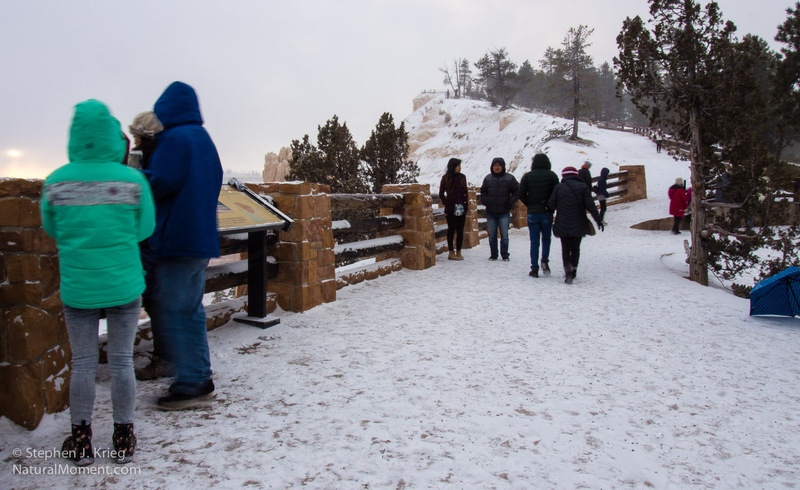 I went to Bryce Point, where a busload of Asians were already swarming about on the trails to the overlooks. I set up my tripod to steady the camera in the not yet bright light of the storm. An Asian woman tapped me on the arm, asking “You wait for sunrise?” They were all excited to be there. The sun was already up, though struggling to make itself visible through the snowfall. 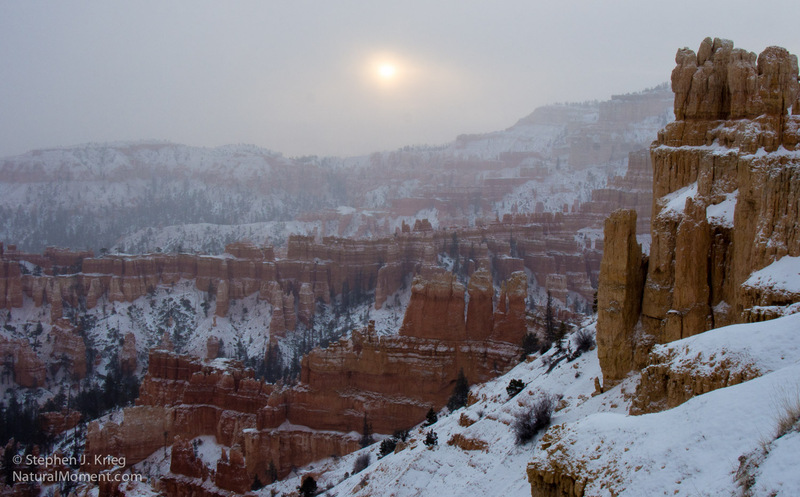 Snowy sunrise, Bryce Canyon National Park. I wasn’t in the mood to be tourist-sociable, because the light was closing fast. The snow was shutting the curtain, for who knew how long. As the rest of the tourists boarded their bus, an elderly passenger hung back, alone. He held his smart phone above his head and slowly circled around the scene, apparently videoing it. And singing, some kind of religious song, I guess. I almost turned my own video recording function back on to capture him doing it. But I demurred, thinking it too intrusive. I was quite satisfied with what I had. As early as it was, I had to make some tactical decisions. Wait out the storm, or travel on? Wish you were here (to scrape the windshield). Photo locations: Prescott, Arizona; Bryce Canyon National Park, Utah.